For those of you who need a little more, Big Betty is the wine glass that fit your needs. It holds an entire 750 ml (25 oz) bottle of wine and stands 10” H x 5” W, which equates to about four to five glasses. Because it’s OK to indulge in the finer things of life. Who wouldn’t want an excuse to enjoy an entire bottle of wine? Big Betty is an excellent gift for friends, family, and coworkers, that’s not only a novelty, but will also be their favorite wine glass of all time. Big Betty comes in three versions: the original, Dinner is Poured, and Friend, Family, Therapist. The original Big Betty is a classic that’ll fit any home bar, while the two engraved options offer a witty dose of humor. 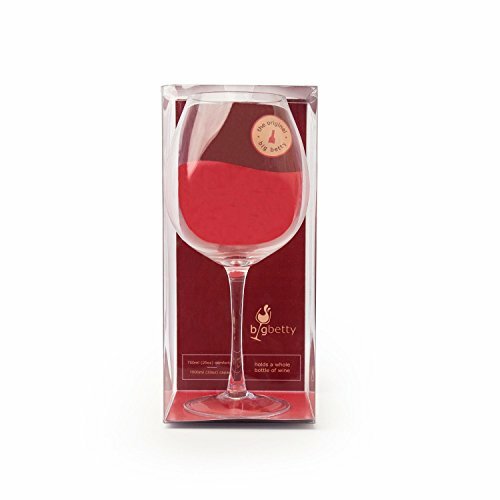 AN ENTIRE BOTTLE - Finally, a wine glass to fit your needs. The Big Betty fits an entire 750 ml bottle of wine comfortably. If you limit yourself to just one glass a day, you better make it the Big Betty. CREATIVE GIFT IDEA - Consider your holiday and birthday shopping done. Your friends and family members will appreciate (and actually use) this unique gift. Whether it's for a 21st birthday, anniversary gift, stocking stuffer, or bachelorette party, the Big Betty is always the hit of the party. SLEEK DESIGN - The Big Betty lets everyone know you're serious about your love for wine. And now, you can enjoy your ideal amount of wine - in style! EASY TO CLEAN - The glass is high-quality and it's recommended to hand wash and allow to air dry. If you have any questions about this product by Big Betty, contact us by completing and submitting the form below. If you are looking for a specif part number, please include it with your message.